I almost don’t know what to write about I’ve had such a busy few weeks! My roommate’s boyfriend has been visiting for about a month now so between juggling exploring with him, studying, and doing other things it has been busy! My own friend came and stayed with us for about a week as well! I haven’t seen her in almost a year so that was really exciting! Our little apartment was quite the full house for a bit! But last weekend was one the the biggest highlights I’ve had in Australia to date. After studying pretty hard for a couple of weeks and writing 2 exams on the Friday our brains were dead and in huge need of a mental break! Thus we kicked off our weekend by going out for supper and heading out to a footy game! Footy is a sport unique to Australia (I think… correct me if I’m wrong) and it seems to me to be a bit of a cross between football and rugby. I loved sitting in the huge MCG stadium and cheering for a team I just learned about and taking in all the sights and sounds. I was highly entertained by the fact that in Melbourne you can get meat pies at sports games (instead of hot dogs and hamburgers) and single glasses of wine and cider (So classy, Australia). I like to think I did a pretty good job of trying to memorize all the rules of footy. After that we went into the CBD (central business district aka downtown) for some late night snacks and exploring! My friend and I enjoying the game! This is the part of the weekend I really loved: The 4 Canadians (Me, Jessica (the roommate), her boyfriend, and my friend) decided to road trip the Great Ocean Road. It is the world’s largest war memorial and FULL of amazing coastal sights! 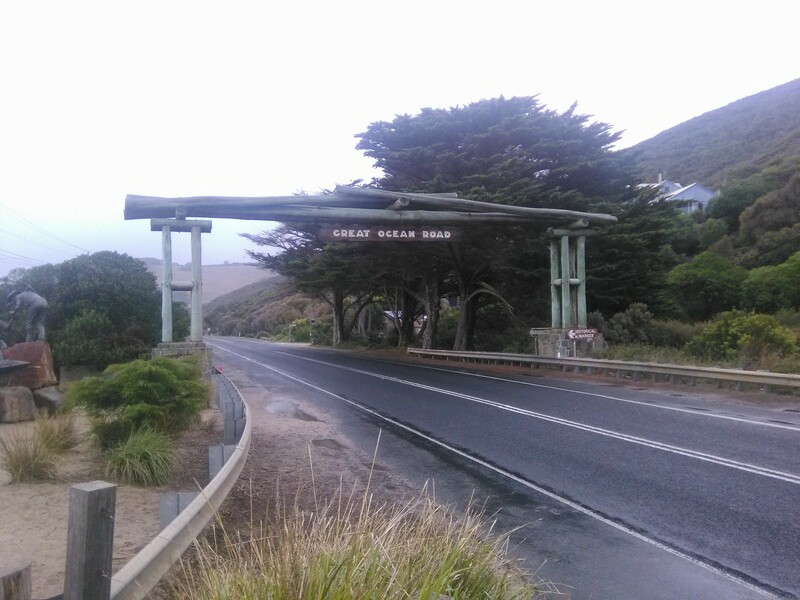 The Great Ocean Road is one of the main tourist attractions in Victoria and stretches for about 245km. It can also be backpacked or camped—plans for the future! We rented a car and left on Saturday morning! First stop was Bell’s Beach where the famous Rip curl surfing competitions are held. The waves were huge and despite the rain and the wind there was still a lot of surfers out in the water! I’ve actually never seen so many surfers before in my life so I found it really fun to stand there and watch them bobbing around in the water before popping up and riding the waves. Apparently it is a very Australian thing to eat fish n chips on the beach… so we had great intentions at lunch time. However, autumn in Melbourne had alternative ideas and we got rained out. We enjoyed our fish n chips in a nearby park in Anglesea whilst watching a kangaroo! There was also a quirky sulpher crested cockatoo that found and ate a whole donut as his lunch! cliffs, rainforest, and wind. LOTS of wind. The 12 Apostles cannot all be seen from one view, and some have crumbled and fell into the ocean over the years. We stopped at a cool cafe for lunch and to warm up before making the long drive home! We still got out and looked at a lot of the sites we had missed, including a whale nursery (we were a bit early in the season… need to come back in a month or so to catch some Southern Right whale sightings) and Cheeseworld (where we obviously bought cheese and sampled their ‘world famous’ milkshakes!). One thing we all wanted to do was a quick rainforest hike, so we took advantage of a momentary break in the wind and the rain to go for a quick hike into the forest to check out Triplet Falls! Apparently there are supposed to be platypus in the creek at the bottom—but we didn’t see any! By the time we finally made it back into the city it was dark out, but since our weekend wasn’t full enough we decided to head down to Lygon Street. Lygon is in the suburb of Carlton which is a very Italian district. The street is always bustling and full of good food and amazing gelato. It was my friends last night in town so we wandered around Lygon before heading back to our apartment to crash!